The City of Tulia recently hired Anthony Longoria as a patrolman for the Tulia Police Department. Officer Longoria not only brings his experience as a four year police veteran, he also brings his partner, “Mirko” to the department. Mirko is a three year old, single purpose, German Shepherd, imported from the Netherlands and trained to detect narcotics. “This is the first ever canine drug detection dog for the City of Tulia,” said Chief Jeffrey Yarbrough. “We are thrilled to have Officer Longoria and Mirko as members of our department and we look forward to watching them work in our community.” Mirko is a passive alert detection canine, according to Chief Yarbrough, which means that when he detects the scent of narcotics, he sits rather than scratches. “This provides an added benefit for us and the public because his detection method does not result in damage to personal property,” said Yarbrough. 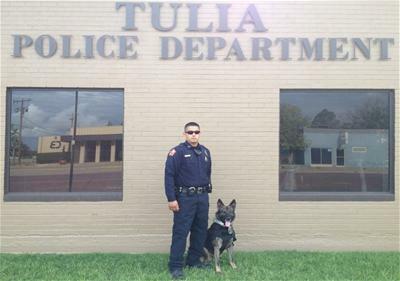 Officer Longoria said, “Mirko and I are happy to be in Tulia as a police and K-9 team. We look forward to providing the best of our training, experience, and service not only to the community but to Tulia ISD.” Officer Longoria comes to Tulia from the Floydada Police Department. He is a four year police veteran and is a certified K-9 police dog handler. Officer Longoria is also a member of the National Narcotic Detector Dog Association and the National Police Canine Association. Mirko was purchased from the Little Rock K-9 Academy in Little Rock, Arkansas, where Officer Longoria received his K-9 handler training.